Last offshore race of the season and with a no show from Raffles we were already assured of the overall championships before the start but no reason not to try for a good result. Hovered around the start line and managed get first over the line just ahead of Dogmatix who did a good timed run and were closing at speed. 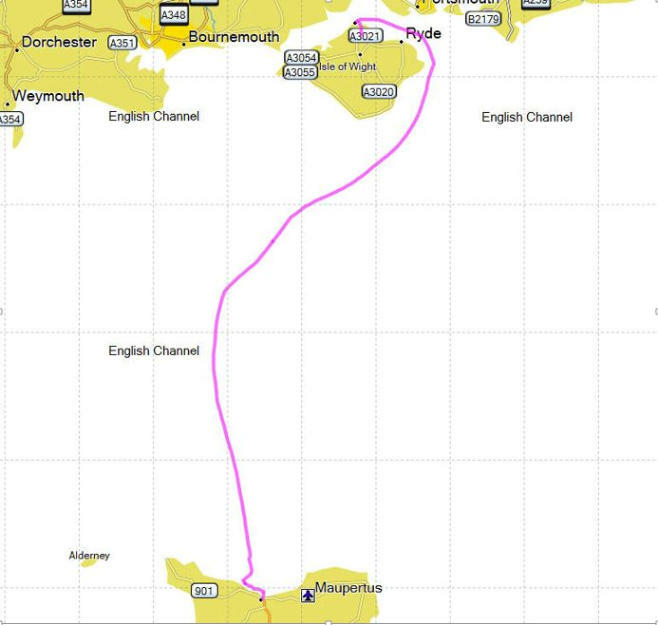 Headed the fleet down the Solent to the Forts with the kite up and headed to Bembridge where we gybed for the cross channel leg. Held the gybe till just before 04:00 when the tide turned but as soon as we were on the other gybe we picked up speed so probably could have gybed earlier which most of the rest of the fleet seemed to have done. With the late gybe the angle into the finish was pretty tight and as the wind built we had a few broaches. At about three miles off the wind veered by 40 degrees so we dropped the kite but then the wind died so instead of an expected finish of about 09:20 we did not get into 10:37. Getting across the finish line was a bit tricky but having seem White Knight of Wessex hugging the wall we headed right in shore and crept along to the Western entrance of the Grande Rade. Luckily as we got to the entrance the wind picked up slightly and we crept right in shore and passed the finish transit near the beach. Excellent day in Cherbourg celebrating our second place in the race and overall championship win.